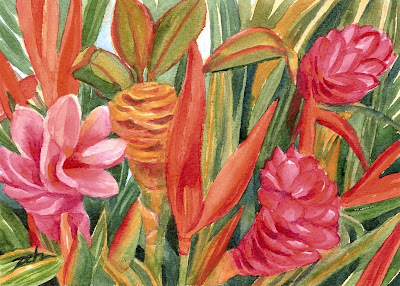 When I did this painting, I had no idea what kind of tropical flowers these were. But today, one of my watercolor students told me they are ginger flowers. She is a landscape designer and knows her flowers. So I'll believe her, although I thought ginger flowers were red. Guess I have some studying up to do on tropical plants!